Xiaomi is a name well-known in the smartphone industry of India. The Chinese giant has built up a reputation for producing best-seller smartphones, but it isn’t the easiest to get them for yourself per se. If you’re a genuine buyer from India, who’s planning to get the latest Xiaomi smartphone, then you’re acquainted with those bothersome flash sales. But you must be thinking flash sales have existed from the launch of the very first Xiaomi phone – the Redmi 1S, then what’s the problem now? While initially, Xiaomi had every right to claim lack of units to justify flash sales, it’s just not the case any more with major production facilities right in the country. Secondly, the brand has become so well established that the number of people flocking to the flash sales has grown exponentially with each year – thanks to the resounding success of the Redmi Note 4 last year. However, Xiaomi has persisted with the strategy, despite claiming to be the No 1 smartphone brand in the country. With its recent Redmi Note 5 and Note 5 Pro devices in India, flash sales were back, and the phones which are being seen as the best ever by the company are currently wildly popular. Mi Fans! something big Joke is coming… It's time to waste some more time on fake flash sale. Very nice.. But i can't understand what you are going to do (as observed last 2 flash sales)… Why disappointing Fans with this Flash sales… Whatever it going to launch just bring huge quantity…. And if you thought that people do complain, what’s the big deal? 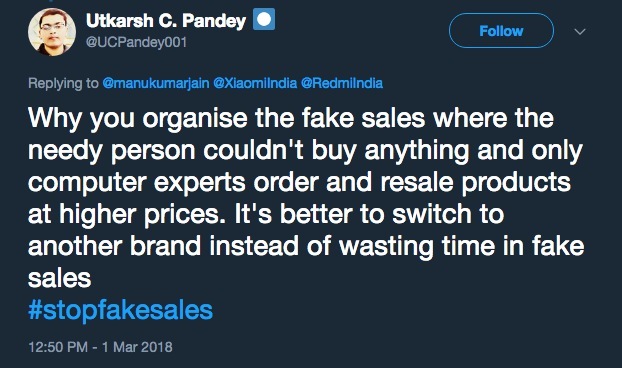 Well, check out this tweet from another genuine buyer who’s been attempting to order the Redmi note 5 Pro for past two weeks but failing, only to find out that other people have bought multiple devices and are now selling them at a premium online. After seeing the outpouring of cries from the fans, we decided to investigate this re-selling practice (or are they scams?). While we didn’t go undercover, we uncovered a mini parallel economy which thrives on the scarcity of flash sales. 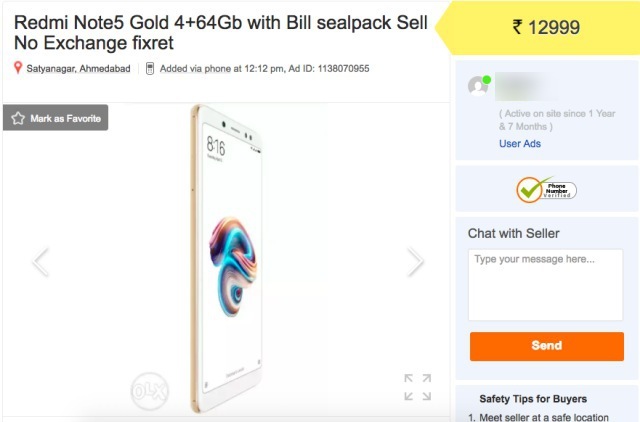 You may or might not be surprised to hear what we came across when we tried to buy a Redmi Note 5 on online marketplaces such as OLX or Quikr. On popular platforms such as Quikr, OLX, and eBay, there is a flood of listings and the reality of the situation struck me. I discovered that not only the price being quoted in these listings was considerably higher, i.e ₹500 – ₹2000 premium, but the re-sellers also had more than one device available for sale. At least a few of these sellers are running scams and asking for advance payments. 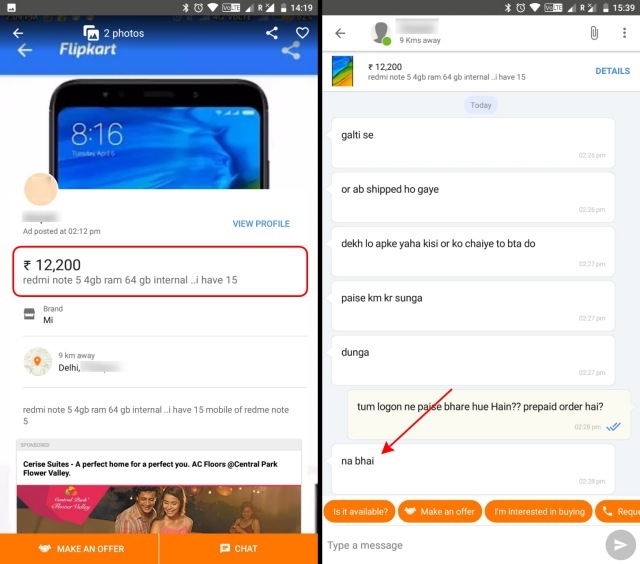 Wecontacted one of these re-sellers, who as you can see in the screenshot attached below, had ordered more than 15 Redmi Note 5 devices. The re-seller, a Delhi college student, told us that he and his friends placed the orders during the flash sale and used cash-on-delivery (CoD) payment method. The phones are currently in transit and will be delivered this weekend. We were informed that we can collect the phone at the time of delivery, directly from the Flipkart delivery person, and pay them the MRP. This facility comes with a charge of between Rs 200 and Rs 400. 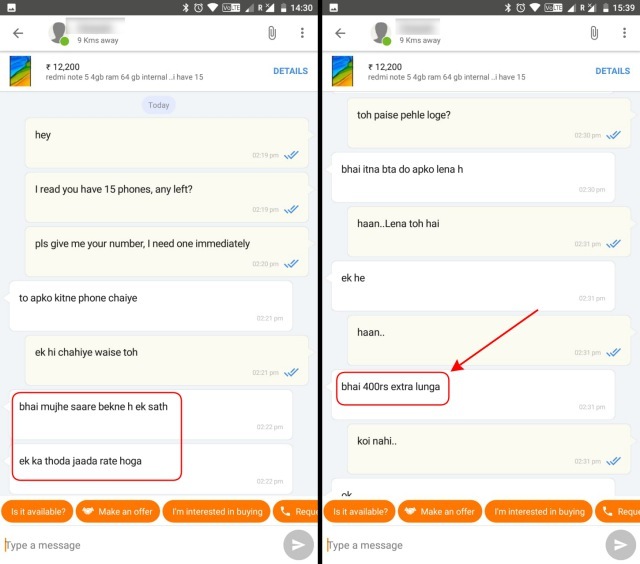 Further into the conversation, the re-seller started negotiating the price (or more precisely, the premium) and it became clear that he was looking to offload all 15 Redmi Note 5 phones at the same time to make a quick buck. The re-seller asked for ₹200 a device as premium if I planned on buying all 15 devices and ₹400 for a single piece. This means I’d have to shell out ₹10,400 to get the base model of Redmi Note 5. These re-selling practices are not just limited to the Redmi Note 5 or Redmi Note 5 Pro. We also discovered numerous listings for the recently launched Mi TV 4. Here, these re-sellers are asking for an even bigger ‘fee’ with premiums as high as ₹6,000 on the sale of the TV, which are also in transit. Beebom also contacted a phone dealer in Faridabad, who disclosed that they’re able to snag 3-4 high-profile devices such as the Redmi Note 5 during the flash sales simply by gathering a big group of 20 odd people. When the flash sale stock runs dry, they use their contacts in Mi Home stores to find out if devices, be it the Redmi Note 5, Redmi Note 5 Pro or the Redmi 5A, are in stock. These are also bought and sold at a premium of around ₹1000. Of course, majority of the genuine buyers have to wait for weeks before the demand dies down and a flash sales turns less crowded. While dealers and re-sellers have the wherewithal and the financial incentive to go the extra mile to get the device, ordinary buyers will not even think beyond asking a colleague or friend to help out. The re-seller, who may have ordered many devices, and can simply decline the CoD order, if their attempts at re-selling fail. However, these units could’ve been purchased by genuine buyers, and Xiaomi would have had one less angry fan or potential buyer. The flash sales, in our opinion, create a frenzy (or hype, as many term it) among the user base but the outcome isn’t particularly pleasant for them. In fact, the practice of re-selling lends flash sales a bad name in general. We find this false scarcity created by Xiaomi to be against consumer interests. Xiaomi is pulling in a lot of interest, but only releasing a few at a time. It also hasn’t been prompt in addressing the Mi community that’s enraged over the lack of devices in comparison to the demand. And this is post the company’s commitment to “Make in India” and large production facilities operating within the country itself. We contacted Xiaomi for some answers about this bleak situation, flash sales and whether they’ve thought of any alternatives for the future – for example delaying the launch till there is enough stock for a regular sale (yes, that’s a thing, Xiaomi). We also asked them what the company thought of the unsavory nature of the flash sales and this false scarcity which may be pushing people to pay a premium. We haven’t received a response from Xiaomi or its PR team as of now, despite highlighting the possibilities of scams related to flash sales. We will update the article if and when Xiaomi replies. What are your opinions on this situation? Should Xiaomi move past flash sales? Or take measures to provide ample stock or curb the re-selling of its devices online? Let us know your thoughts in the comments below.